I've enjoyed the story and the art immensely. i know i already said how happy your art makes me, but it really does. Thanks buddy. I'm actually working on something right now. Don't know if you ever came across Who Wants to be a Kommando by Chazz Huggins? Well I'm drawing a little group shot of Gadnuk's Gutrippas. Look forward to sharing that when its done. I'll properly necro that thread over it too, its well worth it. Eldar Recital: A Warlock leads a band of beleaguered guardians through adversity. For everything there is to know about these guys see Who Wants to be a Kommando by Chazz Huggins. This is worth an exalting chuckle. Well done! Mate, glad you did too. Always a pleasure BC, hope you're doing well these days. I'm on the up. Hoping to get back into painting soon, so peeped on the forum in time to see this. Really glad to see you're still going with it. [ Mordian 183rd ] - an ongoing Imperial Guard story with crayon drawings! Bit of advertising for my Insert your own grot fiction Give it yer best Grot! I reckon I still got room here for maybe three more grots if anyone's keen to get involved. Go on, help me finish this one in glorious technicolour. Put it in the soul of every Grot. 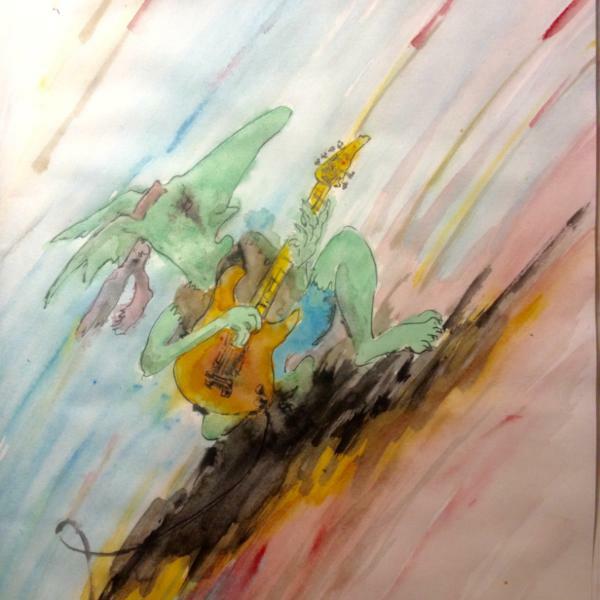 I love a good watercolor and i love a good grot, and i love rockin' out. 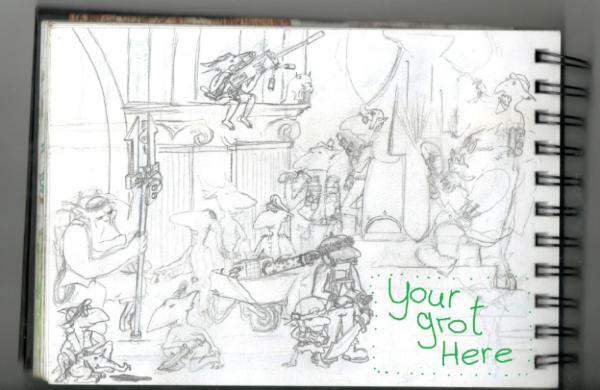 You know how when you're bored you naturally start doodling a Grot with a blunderbuss? No? Is that just me then? Not my best work by any stretch, just a little scrap sketch I found that needed colouring and so I hit it with some watercolours. Still a long way from Quentin Blake but I'm learning. What I need is a fountain pen. The lines are all too hard and definite for the wishy-washy watercolours. It just looks like a smoother block colour treatment of the same old thing. Maybe it's just a boring picture that lacks much artistic flair. More wiggly lines more washy colour that's what I'm aiming for when I think of watercolour illustration. ...not this really. So then I had another go and produced this. 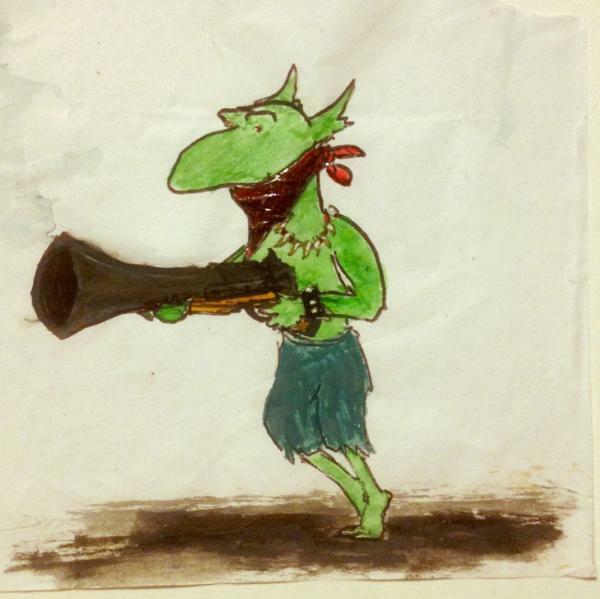 It's Gulgog Tuftoof's characters from our Grot Mob collaborative fiction project Give it yer best Grot. Cutty the absent minded Mek and his minder Weazul who is stopping his crazy ork boss from blowing himself up. Another watercolour effort this time with maybe a bit more... artiness going on. These are delightful. Well done. I too would have went for cutting out the neat looking shield from that container - it would look cool on my armor and cool protects You better, right?! I have to admit that this is like no other painting log I have seen. bounce over to Blunder the Wonder Grot in Dakka Fiction to read about him. More Blunder-fun to follow shortly. So here is the story and artwork associated with Blunder The Wonder-grot. In Limerick form! And even rend armour asunder. Was truly a sight to behold. There was nothing that grot couldn't blow. And attracted a lot of attention. He blasted whatever they sent him. When a Titan came stomping his way. and squashed him beneath where it lay. If you enjoyed that then check out my Epic Poem Version of The Adventures of Smirking. Just got done on a picture of Smirking's dream from chapter 10 of Smirking Da Chosen one . Lovely stuff! I really liked the tale of Blunder the Wonder-grot! I need to catch up with your written stuff when I can sit down at a PC properly. I'm glad Smirking got another run. Dang but how did i miss the limericks. They are brilliant, and beautiful. Thanks everyone. It makes me happy to know my silly notions about orks and grots make other people smile too.